Indonesians Seek Justice – Yeah Good Luck With That. Nearly fifty years ago, the Australian, British and U.S. governments supported Indonesian President Suharto’s seizure of power and subsequent anti-communist purges. The families of the victims are still waiting for justice. Of course, most Aussies are still completely ignorant about our role in Suharto’s crimes. One of Suharto’s greatest crimes was the invasion and annexation of East Timor, also backed by Western governments — especially Australia. Up to 200,000 people — around one third of the population — died in East Timor as a result Indonesian occupation. Australian ambassador to Indonesia at the time of the invasion, Richard Woolcott, recommended that Canberra back the invasion, because Australia could “more readily” negotiate a deal with the Suharto to give Australia access to the oil and gas in the Timor Sea than with an independent East Timor. In 1985, Australia became the first country to formally recognise Indonesia’s illegal annexation of East Timor. The Timor Gap Treaty, signed by Australia and Indonesia in 1989, secured the division East Timor’s gas and oil deposits between the two countries. 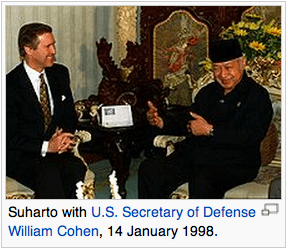 As usual, the deal with Suharto was all about plundering the resources of developing nations. The deal was that Indonesia under Suharto would offer up what Richard Nixon had called “the richest hoard of natural resources, the greatest prize in south-east Asia”. In November 1967 the greatest prize was handed out at a remarkable three-day conference sponsored by the Time-Life Corporation in Geneva. Led by David Rockefeller, all the corporate giants were represented: the major oil companies and banks, General Motors, Imperial Chemical Industries, British American Tobacco, Siemens, US Steel and many others. Across the table sat Suharto’s US-trained economists who agreed to the corporate takeover of their country, sector by sector. The Freeport company got a mountain of copper in West Papua. A US/European consortium got the nickel. The giant Alcoa company got the biggest slice of Indonesia’s bauxite. America, Japanese and French companies got the tropical forests of Sumatra. When the plunder was complete, President Lyndon Johnson sent his congratulations on “a magnificent story of opportunity seen and promise awakened”. Thirty years later, with the genocide in East Timor also complete, the World Bank described the Suharto dictatorship as a “model pupil”. So this is how it works in a corporatocracy – when someone else has something you want, you either send in your country’s army on a false pretext to take control of the land, or you support an indigenous general to engineer a coup d’état (the preferred model during the 60s through to 9/11, after a series of disasters such as Vietnam and the Bay Of Pigs made it difficult for Americans to just invade where and when they please). What do you think the chances of the Indonesians getting justice are when it would probably require exposure of the role of the U.S. and Australia? Good luck with that. ← Chomsky: It’s Hard To Look Into The Mirror.